The LI-7700 Open Path CH4 Analyzer features an open sample path that measures methane density in ambient air. The LI-7700 integrates easily with LI-COR eddy covariance systems without requiring any additional components. Using GPS clocks and the Precision Time Protocol (PTP), methane data are synchronized with wind speed and other measurements with sub-microsecond accuracy. Methane fluxes are computed on the SmartFlux® System at the same time as CO2 and H2O fluxes. For other applications, the LI-7700 can be ordered with the optional LI-7550 Analyzer Interface Unit, which provides analog, RS-232 serial, and SDM data outputs, as well as other functions. 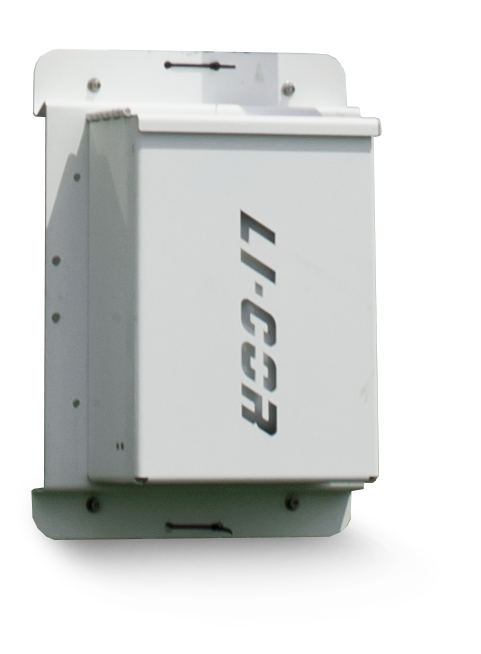 The only open path methane analyzer designed for field deployment in eddy covariance systems, the LI-7700 features innovations that ensure high performance, low-maintenance operation in the most demanding environments. A technological marvel, the LI-7700 maintains accuracy over a wide range of temperature and pressure fluctuations. The LI-7700 is capable of 40 measurements per second. The LI-7700 optical source is a single-mode tunable near-infrared laser, which operates at ambient temperature. Using Wavelength Modulation Spectroscopy (WMS), the laser scans across a single absorption feature of methane with high resolution. The wavelength is modulated across the absorption band at sub-MHz frequency. The LI-7700 demodulates the resulting signal at twice the modulation frequency. It compares the demodulated signal to a reference signal shape to determine CH4 concentration. Pressure- and temperature-induced changes in line shape and population distribution, as well as changes in laser power and mirror reflectivity, are compensated using computational fitting algorithms. This ensures that measurements remain accurate over a wide range of pressure and temperature conditions. Standard with each LI-7700, the washing unit includes a washer fluid reservoir, pump, spray nozzle, tubing, and power cable for the washer. The washing unit provides the self-cleaning capability for the lower mirror. The LI-7550 Analyzer Interface Unit expands the data storage and output options of the LI-7700, including analog, RS-232 serial, and SDM output to use the LI-7700 with Campbell® Scientific, Inc. systems. The following data are excerpts from a poster presented at AmeriFlux in 2011. Spectral and co-spectral analysis is a powerful tool to evaluate the performance of an eddy covariance flux system—more specifically, the performance of the sonic anemometer and the gas analyzer. As shown below, the normalized power spectrum of the LI-7700 follows the theoretical curve, indicating the LI-7700 has sufficient resolution and response time for eddy covariance flux measurements. The data below are from a methane eddy-covariance flux system at a zero-flux site. Chamber-based soil methane emission measurements over a few years at this site show no methane emission. McDermitt D., G. Burba, L. Xu, T. Anderson, A. Komissarov, B. Riensche, J. Schedlbauer, G. Starr, D. Zona, W. Oeschel, S. Oberbauer, and S. Hastings, 2010. A new low-power, open-path instrument for measuring methane flux by eddy covariance. Applied Physics B: Lasers and Optics, 102: 391-405. Matteo D., J. Verfaillie, F. Anderson, L. Xu, D. Baldocchi. 2011. Comparing laser-based open- and closed-path gas analyzers to measure methane fluxes using the eddy covariance method. Agricultural and Forest Meteorology, 151: 1312-1324. RS-232: 57,600 baud, 20 records per second max.